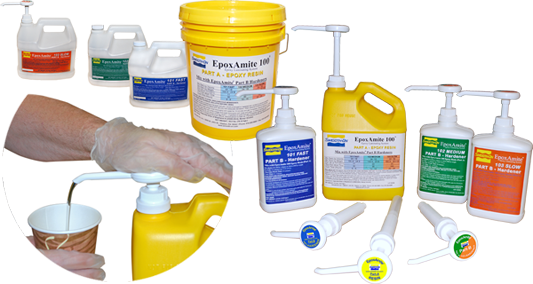 EpoxAmite™ Dispensing Pumps Product Information | Smooth-On, Inc.
EpoxAmite™ pumps are calibrated to deliver the correct amount of Part A resin and Part B hardener with a single push. One Push ‘A’ + One Push ‘B’ = Correct Amount of product to mix. No need to weigh components using a gram scale or measure by volume using graduated cups. Pumps are identified by label on pump head. Note: These pumps are for EpoxAmite laminating resin ONLY. Not suitable for EpoxAmite™ WHITE.